The middle volleyball blocker better known as the "middle blocker" is the player most responsible for keeping the ball from crossing the net into her team's court when the opposing team is in attack. 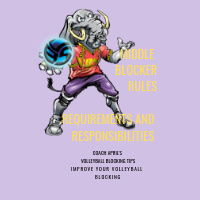 The middle blocker position rules and requirements: As the primary blocker on the team, the middle blocker is the first line of defense in keeping the ball on the opposing team's side during a rally. 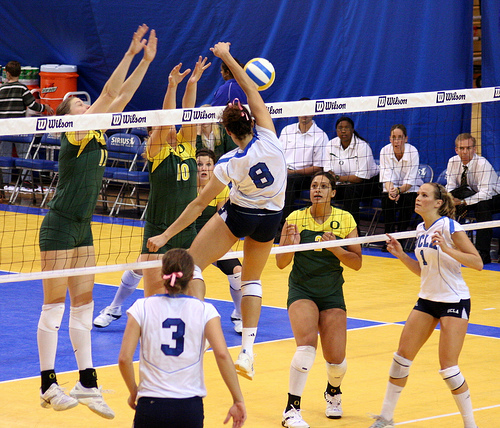 As the primary blocker on the team, the middle blocker is the first line of defense in keeping the ball on the opposing team's side during a rally. Where Does The Middle Blocker Play on the Court? Quite often the tallest person on the team, if you are the blocker who's been told to "play in the middle" when your team is serving the ball, you would be in the front row at the net in the middle area called Zone 3. Once your teammate's served ball crosses the net into the opposing court, your team is officially on defense. Your team's first defensive goal is to block the ball, to do everything possible in the front row to keep the ball from reaching the back row. You, the middle blocker should be watching the ball being passed, reading and anticipating whether the ball is going to be a perfect pass to the setter waiting for it in the opposing team's Zone 3. 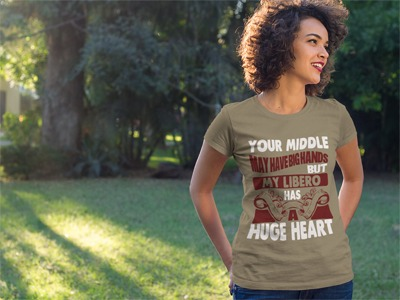 Your middle may have big hands but my libero has a huge heart! Volleyball t-shirts that libbers want for Christmas. Once you, the middle blocker see that the ball will travel to Zone 3 now your eyes should go immediately to the setter. 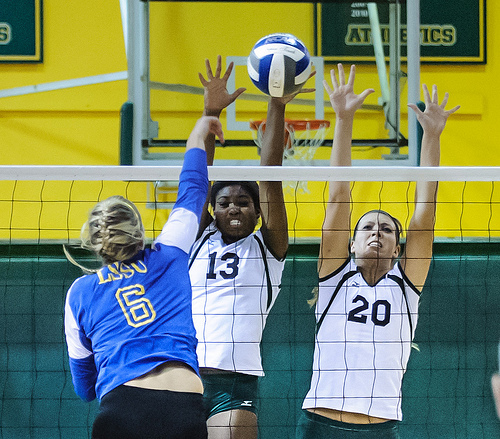 It's the opposing setter's job to fake you out as the middle blocker, period. She is going to try and fake you out and trick you into believing that she will set one of her hitters when she will actually set a different hitter. Her job is run her offense in a way that you as middle blocker will not be able to guess who's she is setting in her front row or her back row. She wants to deliver a set to one of her hitter's that you can't get to. She knows that her hitter has a better chance of hitting the ball to your team's court floor if that hitter is hitting against one blocker. Its much harder for a hitter to attack a ball against two blockers, that would be you and one of your outside blockers, chica! It's your job to read her body language and quickly anticipate, correctly, who she is going to set the ball to and get there to help your outside blocker put up a two girl Wonder Woman block (that's instead of the usual two-man block) which makes it harder for the opposing hitter to attack against. Once you understand who the setter is going to set the ball to, you use specialized foot work while watching and following the ball as her set travels to one of her hitters. 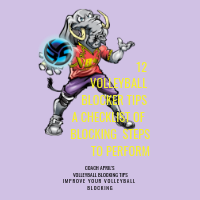 Your specialized volleyball blocker foot work helps you travel along the net to join your left side blocker or your right side blocker in a timed block jump. Now that you know where the ball is being set its time for you to look at your hitter. You look at the opposing team's hitter who's making their spike approach in your direction on the other side of the net. You are reading her body language and arm to see where and how she plans to attack the ball. Together, you and your outside blocker, reach both of your arms over the net, in front of the hitter, in an attempt to create a human wall with your extended arms and hands that "block" the hitter from spiking the ball over the net and into your court. If the ball gets past your block, then its up to one of the three players in the back row to dig the ball up in defense. Once the ball is dug up, your team is now officially on offense. The roles have switched and now its your team's turn to use the next two contacts to get the ball to the floor of the opposing team's court to score a point. Now on offense, you are not the middle blocker, you are now the middle hitter and your primary responsibility is to hit balls from your team's Zone 3 better known as the middle zone of the net. 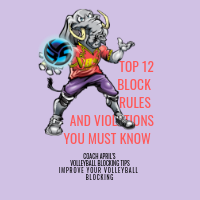 The middle volleyball blocker, now the middle hitter attacks from Zone 3 and the sets you receive are quicker, faster and depend alot on precise timing between you and your setter. 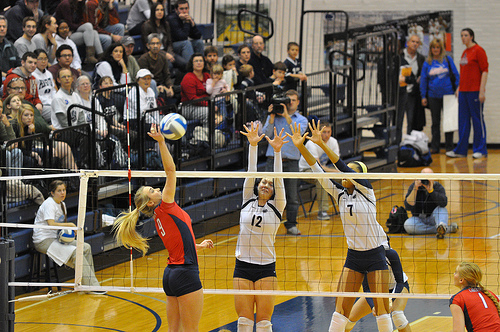 Once the ball re-enters the middle blocker's court during a rally and is dug up by the back row player the middle blocker transitions off the net. The word 'transition" means "to change" in latin, which is what the front row hitters are doing once one of their teammates digs the ball up in defense to the setter, they are changing from blockers in defense to hitters in offense during the rally. The hitters will back up to the ten foot line and wait for the setter to get to the ball that was just dug up in defense. The setter will then run the offense by setting one of her hitters. 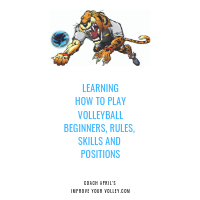 Volleyball Positions: Where Do You Go From Here? Learn more about Blockers and Blocking. Reintroduce yourself to Miss O.I. 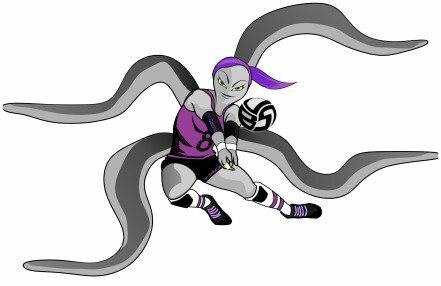 Gotchu the Octopus, #8 , libero for the All Beast VolleyBragSwag All Star Team. Miss O.I. Gotchu, Octopus and libero for the VolleyBragSwag All Beast team.